Our home has been in our family for generations. Our children who are all grown and living away have spent long summers at the beach home swimming, fishing, and searching for "treasures" the ocean delivers daily to the shore. My husband and I are retired high school teachers and decided several years ago to remodel and open our home to families who visit and want to be close to the ocean. We have had so many visitors from all over the world and appreciate the wonderful memories they have shared with us in our guest books. It has been our greatest pleasure to share our home with everyone. Home located a few steps from ocean. Full kitchen with all appliances. Indoor dining for three . Outdoor dining for four. 55 inch LG TV in upstairs living room 32 inch Sony TV in bedroom. Toddler Pack and Play Toddler Indoor/Outdoor Playard. Both upstairs and down stairs were tastefully furnished with lots of attention to detail. A welcome basket with fruit and Hawaiian bread greeted us on our arrival. There were toiletries for our use and lots of clean towels. We spent much of our time on the upstairs porch with a cooling fan making it very comfortable. It was great to have a “beach” so close to the house-watching the waves and hearing the sea at night was a bonus. The property is close to town which we found very convenient. There is no dining table in the upstairs unit; 3 bar chairs are available for eating. A few grumbles; there was a lack of comfortable seating in the downstairs area-chairs outside are good-guess we could have carried them inside. Bedrooms in the lower unit are very small so it is very hard to walk around the beds-difficult in the middle of the night but the beds are comfy. All in all a good stay-we would come back! 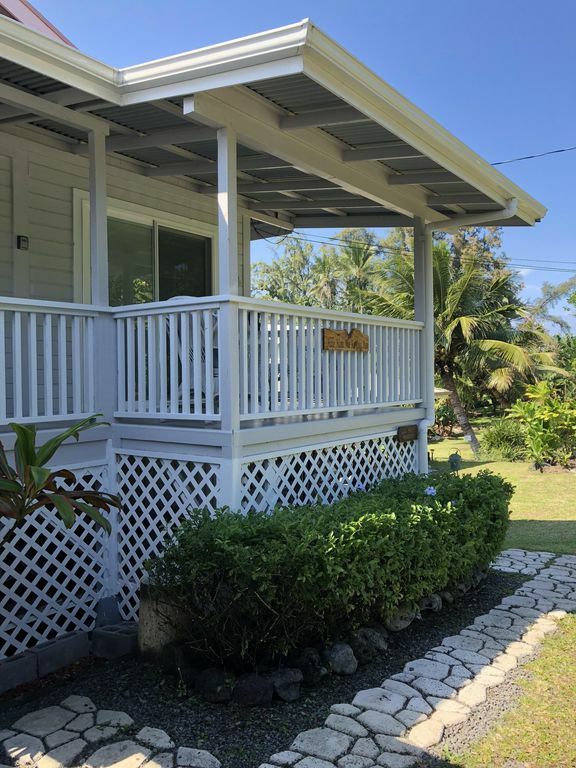 A stone's throw from the ocean, very comfortable, lovely balcony, gardens, and lanai with full barbecue - a true home-away-from-home. Had a wonderful time in Hilo, this house is in a perfect location. We had the most amazing time swimming with the turtles. We will be back soon and bring the grandkids. Claudia was an amazing host. The property had all of the amenities you could require. Extremely neat and clean. Claudia was very responsive to questions. I loved this property. The yard was so amazing with its fruit trees and flowering plants. The covered patio/gazebo was massive with a built in grill. Our unit had two decks. Perfect for morning coffee or evening drinks. We needed more blankets for an unusual cold spell and the owner was there within a couple hours. Very well stocked and lovingly taken care off. Five stars all the way! Rates are based on 2 guests add $20.00 for additional guests up to 4. Cleaning fee is adjusted depending on number of guests and length of stay. Additional credit card fee may apply for international charges (may be deducted from refundable deposit).